Bought faulty, overpriced or substandard goods or services from someone knocking at your door? Report it to Action Fraud. Help disrupt fraudsters by reporting scam and emails you receive to Action Fraud. Action Fraud is not an emergency service, they do not investigate the issue but collate and pass the information to the police. Nottingham Knockers are usually young men who go door-to-door, selling various household products at high prices. They are dropped off early in the morning in a particular location by a large van and are then transported around that area throughout the day. They will offer to show you ID that will likely be ‘Hawkers Work Creation’ or similar and say they have just been released from prison. This company does not actually exist and is purely a laminated piece of card with their picture on. They may try to ‘hard sell’. They will also tell you about how they are trying to ‘make a better life’. 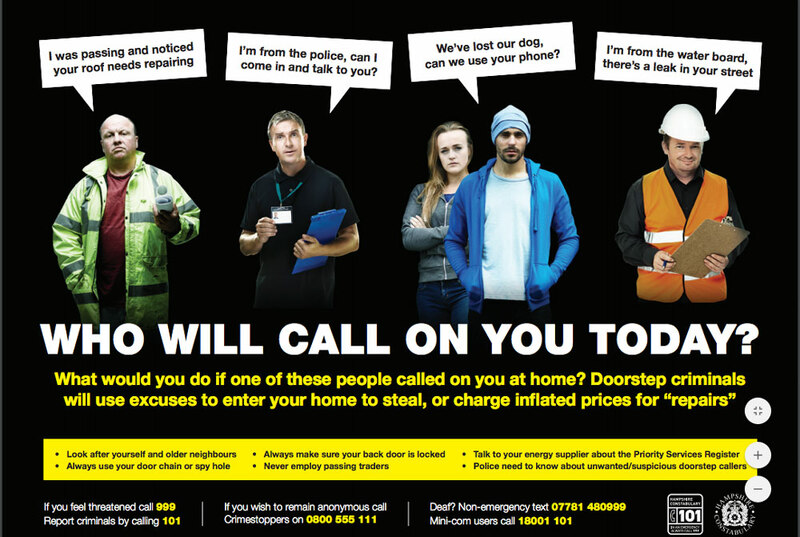 Again, offenders will knock on your door claiming to be someone they are not. They will try to distract you or use a ruse to get into the house. They or another (maybe unseen) person will then steal items from inside your house. Rogue Traders cold call and say that work needs doing (e.g. to your roof) and offer to complete it. The work is usually unnecessary or could be necessary but you will be heavily overcharged (possibly because more work is ‘uncovered’ once work has started). Any work completed is usually very poor, may not be completed or may actually cause more damage than if left alone. You may be taken to the bank in order to provide cash payment. If you do experience any verbal abuse and feel intimidated call 101, tell the Police what was said, and give a description of the person involved.